All good things are built from a solid base, and this is no truer than in our world of canoeing. The basics of the forward stroke are the most important part of a good technique because all the other elements fall easily into place after this. And a good technique not only allows you to paddle farther and faster with less effort, but makes you safer in the water and prevents injuries. Firstly, holding the paddle is just about the most important part of paddling. Hand spacing is a vital part of this - you will get no power if you are paddling with your hands at shoulder width apart. To get the right spacing, hold the paddle horizontally above you and rest the shaft on your head. Move your hands along the shaft until your elbows are bent at an angle between 75 and 90 degrees - 80 degrees is normally ideal for maximum power. Your hand grip on the shaft must be light and relaxed in the palm of your hands. As the blade enters the water, the fingers on the pulling hand tighten to power through the water, while the other hand helps the stroke by pushing the blade through the air with open fingers. This avoids blisters and carpal tunnel syndrome. If you notice that your hands tend to wander along the shaft while you are paddling, it may help to place some tape on your paddle shaft to mark the inside and outside of where your hands should be, and then to make sure that they stay within these lines. Secondly, posture is an important part of canoeing. Bad posture puts added strain on your lower back and can cause many muscular problems in that region. Sitting up straight and tall not only allows you to see what's going on in front of you, but allows a powerful, uninhibited stroke. Even leaning very slightly forward so that you can get a good reach is fine, but you should never hunch in your canoe. Your bum should be comfortable in the middle of the seat and be able to move fairly easily. 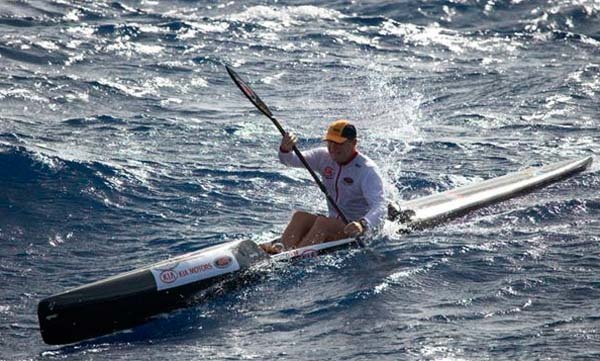 Some top paddlers even use plastic packets to make the seat smoother so that they can move back and forth in the seat. It is also beneficial to learn to paddle without a back rest. Back rests can be handy over long distances, but they inhibit the body rotation that is essential to an efficient stroke. 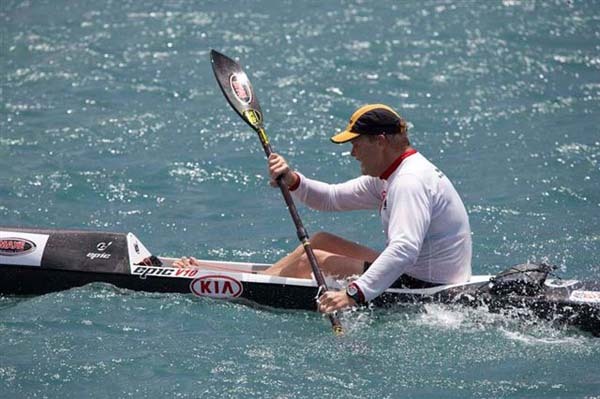 The most common technical mistake in canoeing is not using the whole body to paddle. Beginners often start pulling the blade through the water using only their arms, get comfortable with their style and never change to a more efficient stroke. Although on the surface it could look like the arm muscles are dominant in propelling the boat forward, closer inspection reveals more sense in using the whole body. The large muscles of the back, shoulders, chest, torso and legs dwarf the biceps and forearm muscles. Therefore, it follows that the most powerful stroke possible utilises all these muscles instead of just the weaker arms. As the blade is planted, the shoulders rotate backward and the body twists to pull it through the water. Your arms bend only very slightly toward the end of the stroke, so most of the pulling is done using the shoulders, back and torso. You can add even more power to your stroke by using your legs and hips. For a stroke on the right, start with your right knee slightly bent and as you pull through the water, extend/straighten this leg. This pivots the right hip back in the seat (which is where a smoother seat helps) and this hip rotation multiplies the rotation you can get with your shoulders. In essence, the whole body rotates as the blade is stroked through the water. A good drill for body rotation during the forward stroke is to sit down with your paddle horizontally across your shoulders behind your head. Wrap your arms up and over the top of the shaft with your hands resting on either blade. Now, swivel the paddle to the right and left. You will feel your torso and shoulders moving and not your arms and hands. Notice that if you strive for maximum rotation of your shoulders, your legs will move up and down to help the body rotate further. Remember how this feels on your body as you should strive to use these same muscles in the perfect forward stroke. When Len Jenkins is motoring through rapids and eating up flats, is looks like paddling couldn't be easier. His smooth, relaxed style belies the power and speed that he is generating and it's difficult to measure how efficient his stroke actually is. This only becomes noticeable when his finishing times (normally records) are clocked. The typical forward stroke can be split into four sections, but all components glide into each other to form one steady, fluid motion which results in maximum power and efficiency. Using a single stroke on the right hand side of the boat as an example, Marc Cloete found out about the catch, power, exit and recovery in an effort to help you become more like Len. ‘The catch' refers to the action of spearing your paddle into the water to ‘grip' the water with the blade. The object on the catch is to bury the paddle in the water as quickly as possible to set yourself up for the rest of the stroke. 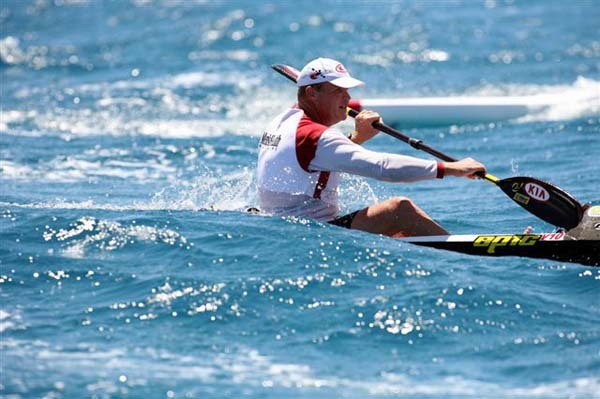 The paddler should reach out with the right shoulder rotated forward and right knee slightly bent. The right arm must be fully extended (straight) just before the paddle enters the water. Both arms are used in the catch and you want to get the paddle as close to the boat as possible at its entry and perfectly square against the water. The paddle should be buried exactly up to the top of the blade - no more, no less. ‘The power' is the main part of the stroke as you are pulling the blade through the water and propelling your boat forward. It is accomplished by rotating the body while pushing or extending the right leg. As mentioned in Part 1, the leg extension pushes your hips back in the seat and allows more shoulder rotation, which generates more power over a longer period. The sweet spot or most powerful moment of the stroke occurs when the paddle is in the vertical position right at the start of the power phase. This emphasises the importance of a good catch and to make sure that the paddle blade is fully submerged. At the sweet spot (when the blade is vertical) it is important to pull with the strength of your torso so that you are using your bigger muscles. The right arm stays straight at the catch and during the first part of the ‘power' because you are using body rotation to pull the blade through the water. Your arm begins to bend only slightly toward the end of the stroke. ....at which point ‘the recovery' occurs. Simply put, the recovery is setting yourself up for the stroke on the other side. The feathering of the paddle also occurs during this phase and you should continue to rotate your shoulders and provide a fluid forward motion in the stroke. Again, you should never bend your arm more than 90 degrees - which will happen if you come up too close to your face during the recovery and result in ineffective body rotation. During the recovery from a stroke on the right hand side, it's very important to push through with your left hand at about eye level and vice versa. This ensures that you are setup for a good vertical catch close to your boat which gives you the most power. When pieced together in the correct manner, these four components merge into one smooth action that ensures perfect efficiency and the most powerful stroke possible - which anyone sitting in a boat would want. Len Jenkins and the boys had better watch out. Most errors in technique stem from not adhering to the three objectives that you should attain while paddling, namely: The paddle must be as efficient as possible in the water; you must use as much of your body as possible; the boat should run as smoothly as possible through the water. Although it may take time to perfect them all, concentrating on these aspects will dramatically improve your forward stroke. In between, a lot can go wrong so look out for the following common mistakes that Marc Cloete describes below. The aim in an efficient stroke is to use body rotation to get the power in the pull, and not the arms. When reaching forward to plant your paddle for the catch, you should rotate your body forward to get a good extension. Some people lunge forward with their whole body, which is just what you don't want to do. Firstly, any lunging action makes the boat bounce in the water and inhibits smooth travel. Secondly, once a paddler has lunged forward, they have to drag their body back to its original place so their entire stroke is neutralised. It's important to use your torso and legs when paddling, just like we've outlined in the previous two parts. A common mistake, especially amongst beginners, is the perception that the longer the stroke is, the faster the boat will travel. The problem here is that there is no power when the paddle is pulled further back than the line of the hips. The exit should always occur just before this line and the paddler will gain much more by exiting earlier and stroking again than pulling further back. Also, if you have pulled back past your hips then the angle of the paddle is such that you are pulling up against water, which will push the boat deeper down and slow you down more than anything else. Burying the paddle incorrectly is also a cardinal sin. As mentioned in part 2, if the paddle is too deep in the water then the timing and exit is compromised while if it is not deep enough, the paddler is not getting as much power as they can. It takes a lot of concentration to get the paddle buried fully to the top of the blade at the start of the stroke but not going too deep at the end of the stroke. Remember as well that the paddle must be square against the water on the catch to get maximum power. Poor posture in the boat is a symptom of many back troubles, which can catch up with you in later life. You should never hunch in the canoe or lie against a back rest for support. This puts terrible strain on your back, so always sit upright or slightly forward in your boat. A good posture allows for an uninhibited efficient stroke. As has been said before in this section, you should never, at any stage in your stroke bend your arms more than 90 degrees. Your bottom arm should be straight at the catch and bend only slightly toward the end of the stroke. Your wrist should also stay locked in one position and should be slightly above the level of your elbow for the duration of the stroke. 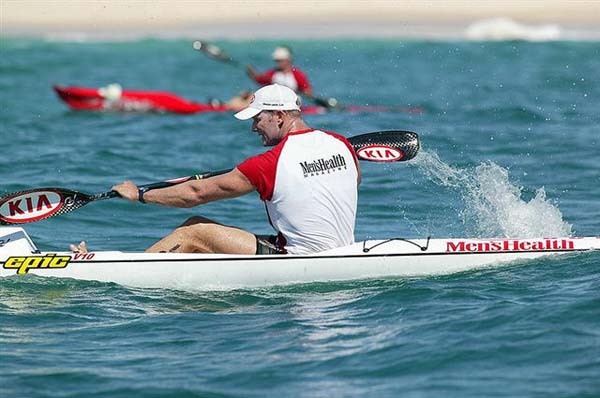 It is also bad to change the level of your pushing arm during the stroke - it changes the depth of your paddle and leads to paddling with bent arms. Your pushing arm should always stay at the same level throughout the stroke. 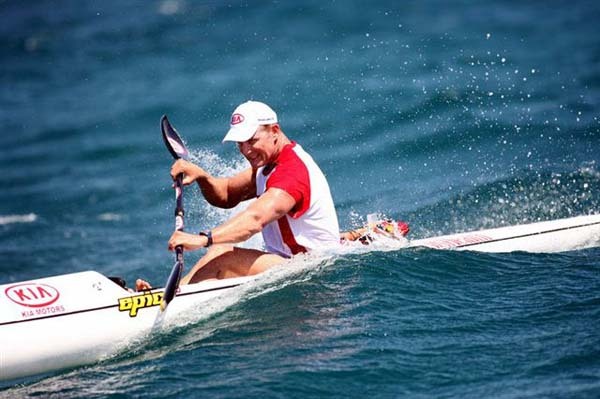 Although the forward stroke should be one fluid motion with the connection from the torso to the hands to the paddle vital, both your pulling and pushing hands help to power the paddle through the water. A rough guide is that 60% is in the pull and 40% is in the push. The grip is another area susceptible to mistakes. Some people paddle with their hands too close or too far away from each other to make the stroke efficient, or they grip the paddle too tightly which can lead to finger and joint problems such as carpal tunnel syndrome. There are different styles of paddling for different circumstances, so make sure you're putting the right amount of energy into your particular paddling experience. A higher top arm is used for sprinting and gives maximum power and speed over shorter distances. A lower top arm conserves energy and enables you to paddle for longer periods - giving greater efficiency over the long haul. In the final instalment on our Forward Stroke series, we take a look at paddling with a wing blade. A wing paddle allows the paddler to centre the blade easier and pull more water with each stroke. It actually forces you to use the larger muscle groups and not your arms, just like you are supposed to. You will even see a 7 to 10% increase in boat speed from the same effort with a conventional paddle. As the name suggests, the cross-section of a wing paddle is shaped like an airplane wing. In the airplane context, as the wing moves forward, the air moving over it moves faster than the air moving under it. As air speeds up, its pressure does down. So the faster moving air above exerts less pressure on the wing than the slower-moving air below, creating lift. This is usually a split of roughly 70% pull from above the wing and 30% push from below. Using the same concept, as the wing blade moves away from the kayak, the water flowing over the wing section of the blade causes it to move forward in the water. There are a few subtle differences between wing paddle and conventional paddle strokes. While you always start the stroke right next to the kayak with both paddles, the wing paddle moves away from the kayak during the stroke. This sideways movement of the paddle causes water flow over the blade, resulting in forward lift. The water pressure building up inside the lip of the blade pushes it out away from the boat as you're pulling on the paddle. It's best not to try and force the blade outwards, but just to let the paddle travel naturally away from the kayak during the stroke. You may notice that because the wing paddle grabs the water better and that it generates lift, you will need a much faster stroke if you use a conventional paddle just to keep up with someone using a wing. This is the beauty of the blade, and one of the reasons it became such a revelation. Nowadays practically every paddler uses a wing. The same basic principles that we've talked about in the previous parts apply with a wing stroke. At the catch, you should have full bottom arm extension with good body rotation, and you should spear the paddle into the water with both arms, burying the paddle up to the top of the blade. A close catch next to the side of the kayak is especially important with a wing paddle. As you may know, occasionally the paddle can hit the deck of the kayak in an attempt to catch as closely as possible. Racers will often put a thick piece of tape or plastic on the deck of their kayak in this area to protect both the boat and the paddle. 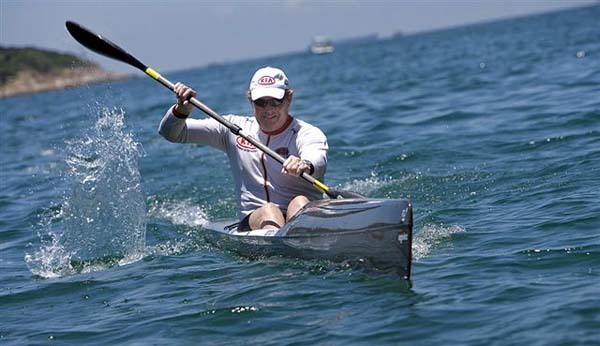 The power phase of the stroke is achieved through body rotation, allowing the wing paddle to move out away from the side of the kayak. Then the exit is at your hip, where the blade should be between 12 and 18 inches away from the side of the boat. During the recovery, the elbow should never bend more than 90 degrees as you prepare for the catch on the opposite side, and the top arm push begins away from your body instead of close in next to your head. 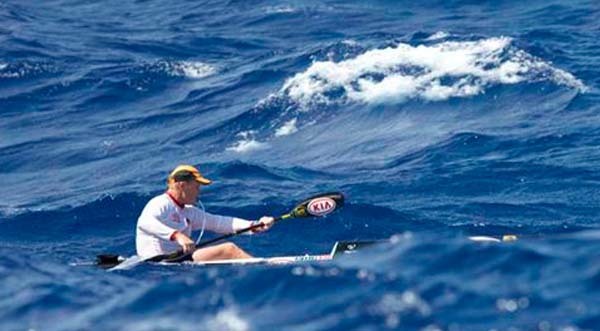 As in all kayak strokes, the sweet spot occurs as the paddle reaches the vertical position. Therefore it is important to have the paddle blade fully submerged and pull with the strength of your torso. Because the paddle blade moves out away from the boat during the stroke, the arms will not bend as much with a wing paddle as they do with a conventional paddle. The wing paddle is both more powerful and more efficient for the forward stroke, however there are some strokes that don't work as well with a wing paddle. It works well with a low brace, but a high brace is more difficult. Sculling strokes are also more difficult with a wing and while it's great for steering with a modified sweep stroke, it's not great to do a bow rudder stroke with a wing paddle. You can Eskimo roll just as easily as with a conventional paddle. The type of paddle that you choose will depend largely on the type of paddling that you do. If you like to paddle at high speed with good efficiency, then a wing paddle is the best choice. If you prefer leisurely paddling or cruising and using more steering strokes then a conventional paddle may be a better choice. 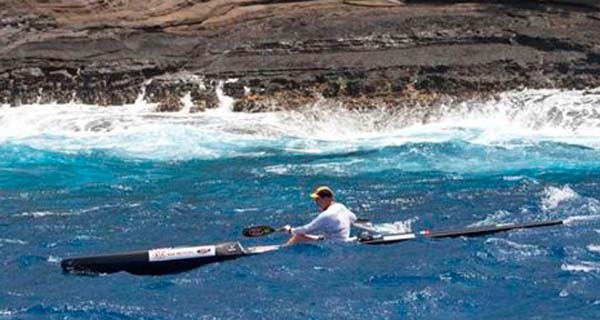 Thanks to Oscar Chalupsky and SA Paddler Magazine for the use of this article.